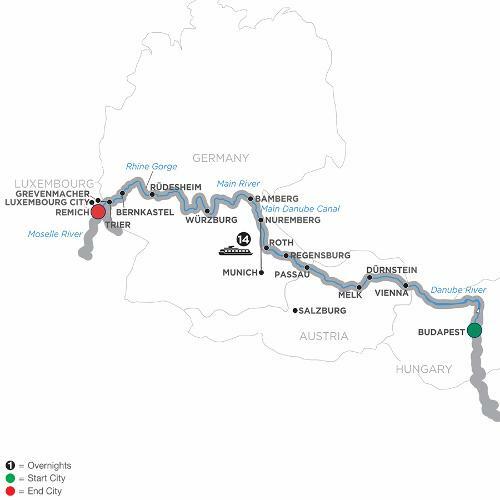 On this Europe river cruise vacation, you’ll sail along the Danube, Main, Rhine, and Moselle Rivers. Board your ship in vibrant Budapest, Hungary then see some of the most intriguing cities of Austria and Germany, before ending your cruise in Luxembourg. On the first portion of your cruise, from Budapest to Nuremberg, also discover the European Jewish Heritage through dedicated sightseeing in Vienna and Regensburg, and an onboard lecture about Jewish culture and history. In Trier, Germany, believed to be even older than Rome—having been populated over a thousand years before the Romans arrived—a Local Guide will show you the sights, including the Porta Nigra, the only surviving fortified gate from the original Roman settlement. Disembark in Luxembourg and take home many happy memories of this fascinating European river cruise! During the first part of the cruise Eva Schloss, stepsister of Anne Frank, will travel with you. Enjoy her lectures on board!